Discover our Selection of Antique Moonstone Rings, Estate Moonstone Rings, Vintage Moonstone Rings and Modern Moonstone Rings. For a Custom Moonstone Ring Design Click Here. Moonstone is a milky-white gemstone with opalescent luster. One 14 karat yellow gold ring. One round cabochon moonstone (1.15 carats). Six blue sapphires (0.43 carats). One 14 karat yellow gold solitaire. One cabochon moonstone (0.87 carats). One silver ring. One round cabochon moonstone (3.66 carats). 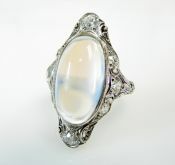 A beautiful vintage 14kt yellow gold ring with 1 round milky white cabochon moonstone, approx. 11.82ct. One 18 karat white gold modern ring. One cabochon moonstone (22.93 carats). One 10 karat yellow gold detailed ring. One oval cabochon moonstone (4.85 carats). One 14 karat yellow gold ring set with one oval cabochon moonstone (12.47 carats). One 10 karat yellow gold ring. One cabochon moonstone (2.19 carats).